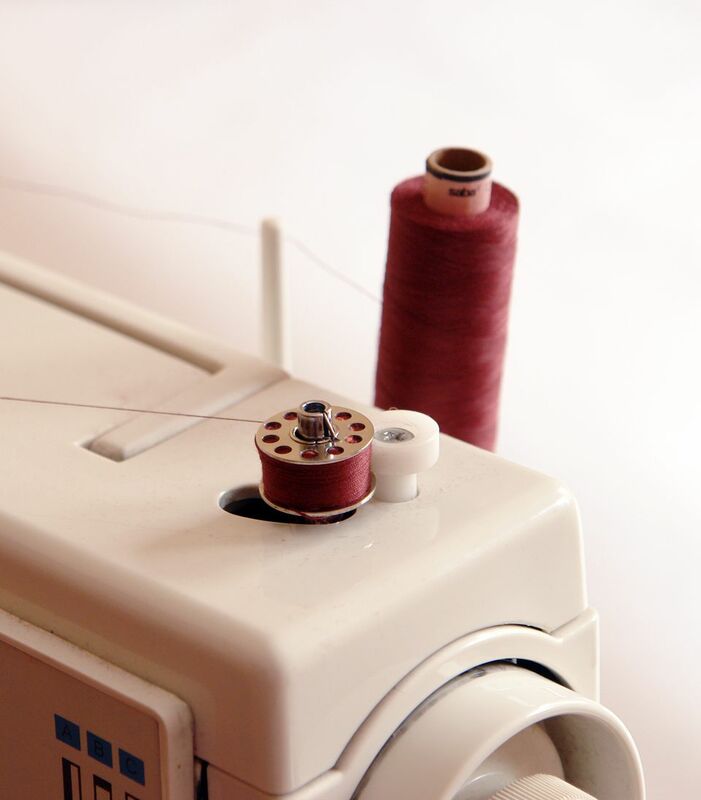 Threading the bobbin of a sewing machine is not a difficult task if you take the thread through the necessary guides and tension controls so the thread is smoothly and evenly wound on the bobbin when you are finished. Having the thread even and smooth will assist in properly formed stitches. Just remember, looping and tangled bobbin thread when you are sewing usually is not caused by the bobbin. The culprit usually is an error in the upper threading of the sewing machine. Place a spool of thread securely on the spool pin. Take the thread to a thread guide that is closest to the spool pin but heading for the bobbin and guide the thread into the guide. There will be some sort of a guide that might look like a button or disk that the thread will go under or between to hold tension on the thread before it goes to the bobbin. If the bobbin has a hole in the side of it, thread the hole so the tail of thread is on the outside of the bobbin and place the bobbin on the final part of the bobbin winding area. If there is no hole in the bobbin, place the bobbin on the last spot of the bobbin winding area and wind the thread around the bobbin a few times, leaving just enough thread tail so that you can hold the thread tail while the bobbin starts to wind. You can trim this thread once the bobbin starts to fill or you can just let go of that thread tail and allow it to wind on the bobbin. The less tail you have the better so that the thread does not tangle on the bobbin and create problems later when that part of the bobbin is being used while you sew. In order for the thread to be placed on the bobbin, the bobbin-threading mechanism must be engaged on the sewing machine. All machines are different but they all need you to engage the bobbin winding in one form or another. The brake might move toward the bobbin that is about to be wound or the bobbin on the holder might move toward the brake. The center of the hand wheel at the end of the machine might need to be loosened to engage the winding process on your sewing machine. Power the machine via the foot pedal or a start button on electronic machines. If the brake is properly set, the machine should stop winding on most machines when the thread fills the bobbin. Note: As always, the sewing machine manual for your sewing machine is the best guide for operating your particular sewing machine. The thread on a bobbin should be as smoothly wound as the thread on a purchased spool of thread. Never use a rough rusty bobbin in a sewing machine. If you are desperate to use a rusty bobbin, sand off any rust and oil the bobbin enough to prevent it from rusting again until you can get to the store and replace the rusty bobbin. Bobbins are not interchangeable between different machines. Bobbins are less expensive than sewing machine needles. Visit a local dealer or a reputable online dealer to get the bobbin that is correct for your machine. Order extra bobbins for your machine so you can have bobbins ready to use when you change the color thread on your sewing machine. Thread labeled "bobbin thread" in stores is a very lightweight thread used for machine embroidery or machine basting. It shouldn't be used for normal sewing. For regular sewing, use the same thread that you use in the upper threading of the sewing machine. When you are sewing and the bobbin thread knots up or creates wads of thread, as much as it seems like it is caused by the bobbin, it is usually caused by the top threading of the machine or the sewing machine needle. See more on machine troubleshooting and solutions to loopy, knotting bobbin thread. A bobbin case must be threaded with the thread that comes off the bobbin. A bobbin is placed into a removable bobbin case so the thread and the slot form an upside-down "V" shape. The thread is passed under the metal and out the side of the bobbin case. A drop-in bobbin is a bobbin that is placed from the top or directly under where the fabric would be while you are sewing. A drop-in bobbin also has a threading pattern that must be followed in order for the upper thread to form stitches with the bobbin thread.